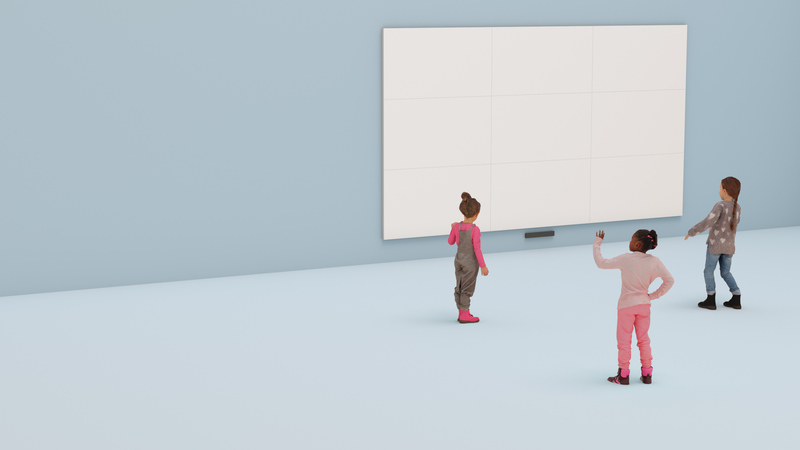 The dimensions of interactive walls can be customized to accommodate a room of any size, large or small. Virtual Ocean – A therapeutic environment with a vast under water seascape of colorful corals, rocks, sand, and kelp that allows children to experience the wonders of the beautiful ocean blue. A Humpback whale and her calve make their way in the distance while Dolphins and Sailfish dart through the seascape. Closer to the children interactive Hermit Crabs, Puffer Fish, and Starfish abound. Action Trails – Children catch unique orbs that activate each type of action trail. Fire trail, laser trail, energy trail, growing trail. Action trails can also be customized with picture or video backgrounds and silhouette fills. All Seasons – Spring, Summer, Fall and Winter are represented in beautiful scenic backdrops while incorporating interactive elements particular to the time of year. Quite sounds of each season enrich the experience in the background. Firefly Nights – A magical experience of fireflies on a warm starry night. Standing still attracts magical fireflies to the children’s silhouette creating a magical glow of energy about the child… The glow builds and builds culminating with the release of energy in the form of a quite explosion of stars into the sky above. Magic!